Kurds are the largest stateless minority in the world, with an estimated 30 million Kurds in a geographic area encompassing territories in Turkey, Iraq, Iran, Syria, and Armenia. They comprise 18% of the population in Turkey and 15-20% in Iraq, and are the third largest ethnic group in the region after the Arabs and Persians. A largely Sunni Muslim people with their own language and culture, most Kurds live in the generally contiguous areas of Turkey, Iraq, Iran, Armenia and Syria—a mountainous region of southwest Asia generally known as Kurdistan (Land of the Kurds). Non-Arab minority populations, Kurds are also an Linguistic minority, speakers of Kurdish, a subdivision of the Iranic branch of the Indo-European family of languages, which is akin to Persian. Modern Kurdish divides into two major groups: 1) the Kurmanji group and, 2) the Gurani group. These are supplemented by many sub-dialects. The most popular vernacular is that of Kurmanji (or Kirmancha), spoken by about three-quarters of the Kurds today. Kurmanji divided into North Kurmanji (also called Bahdinani, with around 15 million speakers, primarily in Turkey, Syria, and the former Soviet Union) and South Kurmanji (also called Sorani, with about 6 million speakers, primarily in Iraq and Iran). The 1920 Treaty of Sevres, which created the modern states of Iraq, Syria, and Kuwait, was to have included the possibility of a Kurdish state in the region. However, it was never implemented. After the overthrow of the Turkish monarchy by Kemal Ataturk, Turkey, Iran, and Iraq each agreed not to recognize an independent Kurdish state. The Kurds received especially harsh treatment at the hands of the Turkish government, which tried to deprive them of Kurdish identity by designating them “Mountain Turks,” outlawing their language and forbidding them to wear traditional Kurdish costumes in the cities, a direct attack on their culture. The government also encouraged the migration of Kurds to the cities to dilute the population in the uplands. Turkey continues its policy of not recognizing the Kurds as a minority group. In Iraq, Kurds have faced similar repression. After the Kurds supported Iran in the 1980-88 Iran-Iraq war, Saddam Hussein retaliated, razing villages and attacking peasants with chemical weapons. The Kurds rebelled again after the Persian Gulf War only to be crushed again by Iraqi troops. About 2 million fled to Iran; 5 million currently live in Iraq. The United States has tried to create a safe haven for the Kurds within Iraq by imposing a “no-fly” zone north of the 36th parallel. Despite a common goal of independent statehood, the 20 million or so Kurds in the various countries are hardly unified. 3. And since these two West Asian states share borders, the impact on their respective bilateral relations with each other under this framework. The main hindrance to the formation of ‘Kurdistan’, literally meaning Land of the Kurds, lies in the fact that the Kurds have internal divisions which often come in way to unify them. They lack any single unified language (spoken or written). Even on the grounds of religion, they do not comprise of a homogeneous category. The majority of the Kurds are Sunni however; one can also find Kurds who are Alevis, Shi’a or Christians. The Kurdish ‘nation’ also would include smaller sects such as the Yazidis, as well as Christian minorities like the Assyrian and the Syrian Orthodox. The area comprising Kurdistan includes approximately parts of eastern Turkey, northern Iraq, north-western Iran and northern Syria inhabited mainly by Kurds. The permanent Iraqi constitution in Article 113 states, ‘This Constitution shall approbate the region of Kurdistan and its existing regional and federal authorities, at the time this constitution comes into force. This Constitution shall approbate the region of Kurdistan and its existing regional and federal authorities, at the time this constitution comes into force.’, hence making it an official-political statement in recognizing the autonomous federal entity of the Kurds and granting it an official recognition internationally. Kurds in Iran are also officially recognized as a minority, and there is a province by the name of ‘Kurdistan’ in Iran. The problem surfaces with the way the Kurds are looked upon in Turkey. The Kurds were historically concentrated in eleven provinces of the southeast. There are also isolated Kurdish villages in other parts of Turkey. Kurds migrated to Istanbul for centuries, and since 1960 they had migrated to almost all other urban centres as well. Turkey’s censuses do not list Kurds as a separate ethnic group. Consequently, there has been no reliable data on their total numbers. Unlike the Sunni Turks, who follow the Hanafi School of Islamic law, the Sunni Kurds follow the Shafii School. However, the Kurds are divided between several states making them a minority in each. The Kurds have often demanded their own independence with varying degree of reciprocity as well as animosity. The focus here would be on how the Issue of Kurdistan has been entertained and dealt with by the two neighbouring states of West Asia—Iraq and Turkey. A short historical schema is shown to understand the situation of Kurds today in these regions on general terms. During the Iran-Iraq War, the Iraqi government implemented anti-Kurdish policies which was widely condemned by the international community, but was never seriously punished for oppressive measures, including the use of chemical weapons against the Kurds, which resulted in thousands of deaths. The ‘Al-Anfal Campaign’ constituted a systematic genocide of the Kurdish people in Iraq. Large Kurdish town of Qala Dizeh was completely destroyed by the Iraqi army. The campaign also included Arabization of Kirkuk, a program to drive Kurds out of the oil-rich city and replace them with Arab settlers from central and southern Iraq. Needless to say, there were blatant violations of Human Rights along with life itself. Saddam Hussein’s regime proved even more disastrous for the Kurds in Iraq. After the Gulf crisis, U.N. Security Council Resolution 688 gave birth to a safe haven following international concern for the safety of Kurdish refugees. 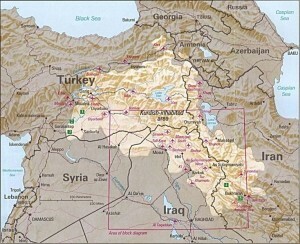 The U.S. and British government established a No Fly Zone over a chunk of northern Iraq; however, it left some of the Kurdish populated areas unprotected.. Bloody clashes between Iraqi forces and Kurdish troops continued but then finally the Iraqi government fully withdrew 1991, allowing Iraqi Kurdistan to function de facto independently. The region was to be ruled by the two principal Kurdish parties—the Kurdish Democratic Party (KDP) and the Patriotic Union of Kurdistan (PUK). Then again, tensions between the two principle Kurdish Parties led to intra-Kurdish conflict and warfare. 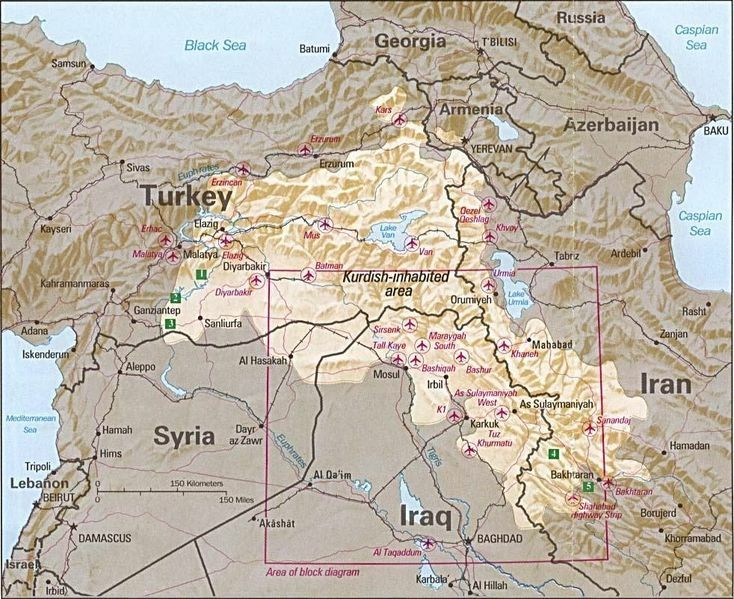 Prior to the U.S.-led invasion and overthrow of Saddam Hussein’s regime in March 2003, Turkey denied the U.S. the bases in Turkey to launch a northern front into Iraq. This Turkish decision unintentionally made the Iraqi Kurds a powerful ally for the U.S. Aided by the Kurds, U.S. Forces were able to open a northern front in Iraq and secure the oil fields in and around Kirkuk. This ensured the Kurds a prominent role in the future of Iraq. The new government for Iraq post-Saddam Hussein proved very comforting for the Kurds. The Iraq Governing Council (IGC) that was appointed in July 2003 had Massoud Barzani and Jalal Talabani, along with three independent Kurdish leaders. The Law of Administration for the State of Iraq for The Transitional Period (TAL), signed March 8, 2004, laid out a political transition process, as well as citizens’ rights, and much of the debate over the TAL concerned the rights and privileges of the Kurds. Further, both the Arabic and Kurdish languages were deemed “the two official languages of Iraq”—an unprecedented gain for the Kurds historically. Further, the constitution also reflected on this change where Islamic principles are to be considered “a source,” but not the only or the primary source, of law. Thus, the assumption based on the recent positive changes showed a gradual improvement in the life of the Kurds in Iraq. The Kurds live across all of Turkey but the majority live to the east and southeast of the country. The republic of Turkey’s treatment of its citizens of Kurdish ethnicity has been a frequent subject of international criticism. It is generally believed that Kemal Attatuk was the main discriminator of these Kurds, known as ‘Mountain Turks’ here (a deprivation of their religious, ethinic, notional as well as their linguistic identities). The Sevres Treaty of 1920 partitioned Turkey, reducing it to one-third of the Empire’s size, and promised the Kurds a country of their own. Ataturk rejected Sevres and rallied Turks in a “war of liberation.” Victorious, he succeeded in scuttling Sevres and replacing it with the Lausanne Treaty of 1923. In 1925, Kurds launched an insurgency to restore the autonomy that existed under Ottoman rule, but the rebellion was brutally put down and its ringleaders hanged in the central square of Diyarbakir. In the 1930s, Turkish government policy has aimed at forcible dissimilation and Turkification policies of the local Kurds. Following the 1937 Tunceli uprising, Turkey adopted draconian measures denying the very existence of Kurds in Turkey and referring to them as “Mountain Turks.” Kurdish language, culture, and geographical place names were banned. Simmering tensions continued until Turkey’s military coup on September 12, 1980. However, the sudden success the Kurdistan Workers’ Party (Parti Karkerani Kurdistan , or PKK) had in mobilizing large number of Kurds during 1980s and 1990s in its struggle against the Turkish state showed that years of Turkish Republican rule that institutionalized and sedimented Turkey’s policy of denial of Kurdish identity, language and culture remained futile. Furthermore, the establishment of the Turkish Workers Party (TIP) in 1961 and its broad agenda offered an election platform where Kurdish demands and national rights could be discussed. The ‘sociopolitical pluralism’ that Turkey experienced during the 1960s weakened the state’s ability to hegemonize the social identity of its citizens resulting in the emergence of a number of alternative discourses challenging the dominant Kemalist identity, the Kurdish nationalist movement among them. In the present context, Turkey’s chances of entering the EU will significantly increase if it can achieve a long-term resolution of its Kurdish issue by continuing and implementing its legal-political reforms in order to tackle its ethnic plurality via liberal democracy and economic development. It would also significantly increase the EU’s credibility and political-economic weight as a global actor and as a social-political project, in the developing world in general and the Muslim world in particular. The more Turkey can secure its relations with its citizens of Kurdish origin through democratic and developmental means, the less it would be threatened by Kurdish nationalism in Iraq and elsewhere. With local elections looming, the AKP initiated full-time Kurdish language broadcasts on Turkish Radio and Television in 2009. Recent positive changes are gradually being witnessed like allowing Kurdish names to the children, etc., which were previously outlawed by the government authority. Turkey is a state that borders Europe and Asia. It is a democratic, secular, unitaty, constitutional republic, with an ancient and historical cultural heritage. Its constitution reasserts the principle of being a secular state, making the Tukish National the supreme identity in its soil. However, Turkish as the official language and the complete disregard for the fact that Kurds have a separate identity on any terms have brought into question its secular, democratic nature. Turkey and the EU relations have evolved with lots of difficulties since Turkey’s application date for full membership on September 12, 1987. Historically, Turkey is a strategically important country for the EU. Still there are certain barriers. The minority treatment issue is one of those barriers. In fact, “respect for and protection of minorities” is one of the principles accepted in the Copenhagen Criteria which defines whether a country is eligible to join the European Union. Turkey’s Kurdish issue, in this sense, is one of the stumbling blocks of Turkey on the road to EU accession. On October 3, 2005, when the European Union formally initiated accession negotiations with Turkey, more attention than ever was focused on the Kurdish problem of Turkey. Until recently, Turkey was even denying having a Kurdish problem to begin with, and speaking Kurdish was a crime according to the law. Therefore, it was sensation when Prime Minister of Turkey, Mr. Erdogan admitted that there is a Kurdish problem. Until then, this problem was “pronounced” as “southeastern problem” or “southeastern issue”. Turkey and Saddam’s regime enjoyed good trade and political relations until the Iraqi invasion of Kuwait in 1991. Economic sanctions imposed on Iraq had an obvious detrimental impact on the economic relations between the two states. Hot air was blown between the two when Turkey allowed NATO aircraft to use its territory to impose the no-fly zone over the north of the country. However, the relations between these two states have entered a new phase since the 2003 invasion of Iraq by the US forces. Since then, the Iraqi governing authority has coordinated with Turkey over issues like border control and trade. Turkey today is one of the important gateways to Iraqi oil. However, Turkey is vehemently against Iraq’s granting of autonomy to the Kurds in the northern Iraqi provinces, as this could lead to demands of a similar nature back home, an issue the Turkish authorities have not yet come to terms with. Iraqi Kurds, threatened with a military incursion by Turkey, find themselves in a pivotal—and ironic—position as Ankara and Washington searched for ways to end attacks by Turkish Kurdish militants holed up in semi-autonomous northern Iraq. Turkey wanted a diplomatic solution to a crisis which has seen scores of Turkish troops killed in cross-border raids by PKK forces. Ankara did not recognize the KRG and refused to meet with its representatives in any official capacity. That reflects Ankara’s fear that any international respect shown to the autonomous Iraqi Kurdish region would only embolden Turkey’s own Kurdish minority to seek similar home-rule status. As Ankara and Washington look for solutions from the Iraqi Kurdish leaders—who are among the strongest supporters of the United States in Iraq—those same leaders see the crisis as presenting them with some valuable bargaining power. One of the main arenas of concern among the recent (post Saddam) bilateral relations between the two bordering state of Iraq and Turkey is definetely the Kurds. Turkey has an abiding fear that if Kirkuk joins the KRG, it will provide the groundwork for an economically viable independent Kurdish state inspiring Turkish Kurds to seek greater autonomy. If Turkey cracked down on the rights of Kurds in Turkey or launched a major military action, either to prevent a referendum on Kirkuk’s status or to attack the PKK, Turkey’s European Union (EU) antagonists could use it as a pretext for impeding Ankara’s candidacy. Its a double jeopardy. Turkey needs a stable and strong Iraq to contain Iran. With powerful Iraqi Shi’a groups acting in ways that advance Tehran’s interests, Iraqi Kurdistan—stable, democratic, and pro-western—could become an essential buffer to sectarian violence emanating from an increasingly chaotic, politically polarized, and religiously radicalized Iraq. But at the same time, the fear remains for Turkey that autonomous Kurdistan could quite obviously entail Turkey’s own domestic Kurds to rise against the Turkish state. Turkey initially joined the US-led campaign against Iraq under intense US pressure. Perhaps the rationale Turkey adopted was that if it couldn’t supercede the US decision to invade Iraq, at least it would have some impact on post war reconstruction if it remained a US ally. The newly elected government of the Justice and Development Party (AKP) gave in to US pressure after a lengthy period of indecision, diplomatic efforts to persuade the Iraqi and US governments to seek a peaceful solution, consultations with the president and the military, and intense negotiations with the US government. However, on 1 March 2003, the Parliament declined the government’s motion to authorize the deployment This was a major blow to US-Turkish relations; Turkey had been a major and consistent strategic partner for the USA, which in turn had supported Turkey in such an important area as the EU membership demands, for one. Turkey had its fear that the PKK, which fought a separatist war against Turkey between 1984 and 1999, would find a safe haven in Kurdish-controlled northern Iraq. The second possible consequence was Iraqi-Kurdish statehood or autonomy. The PKK had proved to be a major threat to Turkish state security. Armed clashes with it, which were believed to have cost more than 30,000 lives, mostly ended when the movement’s leader, Abdullah Ocalan, was captured with US assistance in Kenya and jailed for life in 1999. However, the PKK remained active politically and militarily in Turkey, Iraq, and other countries, including parts of Western Europe. A substantial portion of Turkish military and political leaders long suspected the USA—and Israel—of sympathizing with Iraqi-Kurdish statehood, which would reignite Kurdish secessionism within Turkey, to its own detriment. In October 2003, the parliament authorized the deployment of Turkish troops to join the coalition forces in Iraq, in accordance with US demands. However, this prospect met with vocal Iraqi opposition, especially from Iraqi Kurds. They feared that Turkey would use its military presence against Kurdish statehood—a well justified fear at that time. Accordingly, Turkey’s primary interests lie in, first, Iraq’s economic and political stability; second, the emergence of a democratic regime in Iraq; and, third, the pursuit of friendly and cooperative relations with Turkey by the new Iraqi administration in general—and by Iraqi Kurds in particular. In fact, this outcomehould probably be the overriding strategic objective for Turkey, as well as or the USA, the EU, and Iraqi Kurds. Recently, Iraq has just about entered a semblance of political stability, or at least International Legitimacy, due to the 2005 and 2010 elections. Kurds are definetely in a better position both in terms of gaining autonomy as well as having a part in government. The need of the day obviously requires a changing attitude towards Kurds, not just from the domestic constituency in Iraq, but also from the Turkish perspective. This can be seen as on April 9, 2010, the President of Iraq’s Kurdistan Region, Massoud Barzani, received an official diplomatic visit by the new Turkish consul, Aydin Selcen, who had arrived to take up office in Erbil. Most high-level Iraqi Kurdish officials will readily admit that the key to their future lies in maintaining positive relations with Turkey and also with Iran, which already has a consulate in Erbil. As such,wdisputes and disappointments of the past are being put aside. The establishment of official Turkish diplomatic representation underscores the headway that has been made in transcending these political tensions and building upon the commercial ties that have developed in recent years. Also, The rail link that runs between Iraq and Turkey via Mosul was re-opened in February 2010 after a seven-year closure following the US-led invasion, reinforcing trade links between Turkey and the south of Iraq. Therefore, post-Saddam Hussein, change is definetely in the air for the bilateral relations between both the states of Iraq and Turkey, especially concerning the Kurdish Issue. As Iraq is still in its post-transtitional phase, the future of the Kurdish issue between these two neighbouring states remain quiet uncertain. Like the Berber community, a nomadic tribe, the Kurds do not have a common, unifying language or religious similarities which could bind them together. In the concluding analysis, therefore, it can be surmised that the Kurdish issue today does have a growing significant impact on the bilateral relations between Turkey and Iraq (the focus of this paper), along with Iran and Syria. The Kurds have finally seen new inspiration after the Iraq case in asserting themselves up front and not hiding behind the traditional fear of state repression. What’s more significant is the eventual Turkish Kurd demand for recognition and the state’s acceptance of the existence of a population called the Kurds in Turkey, which was previously ignored as ‘mountain Turks’ or simply seen as a border ‘Southeast’ problem. The Kurds acheiving great political heights in Iraq significantly improves their morale, and they have already been accredited with autonomy and other political benefits. This Treaty of Sevres spoke of an Kurdish State, but this never materialised as the Kurds with their diversity could not establish a united front, whereas during this time frame, state borders were being drawn as permanent structures of mordern states in the Arab world. The missed opporturnity still works as a detriment to the formation of Kurdistan with borders as emphasised by the 1920 Treaty. Even though today we find the autonomous region in Iraq, the creation of Kurdistan, across the borders of several sovereign States, inspite of the geographic continuity of Kurds, seem bleak. The permanent Constitution is that of the 2005 Constitution, the first Permanent Constituion as well as Government Iraq has ever had. According to Human Rights Watch, during the Anfal campaign, the Iraqi government massacred 50,000 to 100,000 non-combatant civilians including women and children, destroyed about 4,000 villages (out of 4,655) in Iraqi Kurdistan. Between April 1987 and August 1988, 250 towns and villages were exposed to chemical weapons and destroyed 1,754 schools, 270 hospitals, 2,450 mosques, 27 churches and wiped out around 90% of Kurdish villages in targeted areas. The Law of Administration for the State of Iraq for The Transitional Period (TAL), Iraq’s interim constitution. Alex Callinicos,’ Fulcrum of World Politics ‘, Third World Quarterly, Vol. 26, No. 4/5, Reconstructing Post-Saddam Iraq: A Quixotic Beginning to the `Global Democratic Revolution’ (2005), pp. 593-608 Published by: Taylor & Francis, Ltd.
James Brown, ‘The Turkish Imbroglio: Its Kurds’, Annals of the American Academy of Political and Social Science, Vol. 541, Small Wars (Sep., 1995), pp. 116-129, Published by: Sage Publications, Inc. in association with the American Academy of Political and Social Science. Khaled Salih, ‘What future for the Kurds? ‘, The Middle East Review Of International Affairs, Vol.9, No. 1, Article – 7, No. 1, Published: The Gloria Center, Interdisciplinary Center, Herzliya. Sonia Roy is a Research Scholar at the Center for West Asian Studies, Jawaharlal Nehru University, New Delhi (India).